Look ma, no car seat! I went to my first New Year’s Eve dance party when I was six months old. I tuck my young kids into bed at 8:00 pm every night. The metaphorical gap between these two statements is huge. It spans four decades and includes significant lifestyle changes that have altered the way we do things and the way we think about things. 3) I am so much more enlightened. Our arguments almost always end with me sending her an email or text message, highlighting a Google-researched article on how to raise a child…the proper way. Don’t you know that you don’t put babies to sleep on their stomachs? You never wrap a feverish child in blankets. Don’t you know? Breast is best. 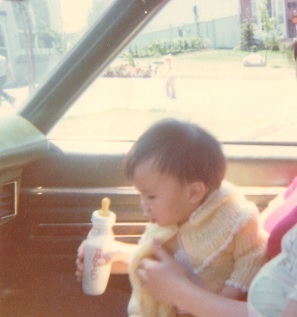 Come on ma, car seats are mandatory. Car seats? Never owned one. And, as far as sleeping on your stomach? Your head is round…You are welcome. First-time parents. First time seeing snow. After becoming a parent, I naturally started to reflect…on my childhood, my parents’ decisions while I was growing up and ultimately their mistakes. But I soon realized that it’s wrong for me to criticize the mistakes and decisions that have ultimately made my life so easy. 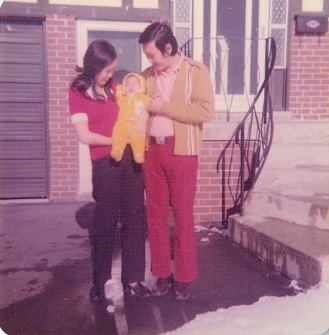 The newly-arrived immigrants, who left the warm island of Jamaica in 1974 to brave their first cold Toronto winter and bring me into this world, worked long and hard to give me and my brother happy lives. We were born having it all – from the big things, like a good education and a home in a safe neighbourhood, to the small insignificant things, like ballet, skating and swimming lessons. I also had the freedom to indulge in silly childhood whims and fads. Back in the day I collected stickers – puffy stickers, smelly stickers, shiny stickers, googly-eyed stickers – Madonna-inspired bracelets and friendship beads. I suppose, if I have to admit it…the gap between me and my mom really isn’t that wide. In spite of the inevitable differences from generation to generation and the technological changes that alter our lifestyle, some things remain the same. Ultimately, we are all simply trying to do our best and love our children. My lips quivered as I typed those words. LOL – I like that name! Thanks for reading…I quickly checked your site…looking forward to reading your posts. What a wise woman your mum is teaching you that song – instilling a philosophy to take with you through life i.e. yesterday is gone – don’t regret it – tomorrow hasn’t arrived so enjoy the beauty of what is around you today… Thanks for sharing – I’ve never heard that song…. Just didn’t realize how wise she was until now :). Thanks for reading! “Ma, I appreciate you. Thank You. I love you”. So beautiful and touching Tina. Your ma and I are lifelong friends and I know the feeling of being loved and appreciated by your child. Very sweeeeeet!! Thanks Aunt June! Very glad you enjoyed reading my story.